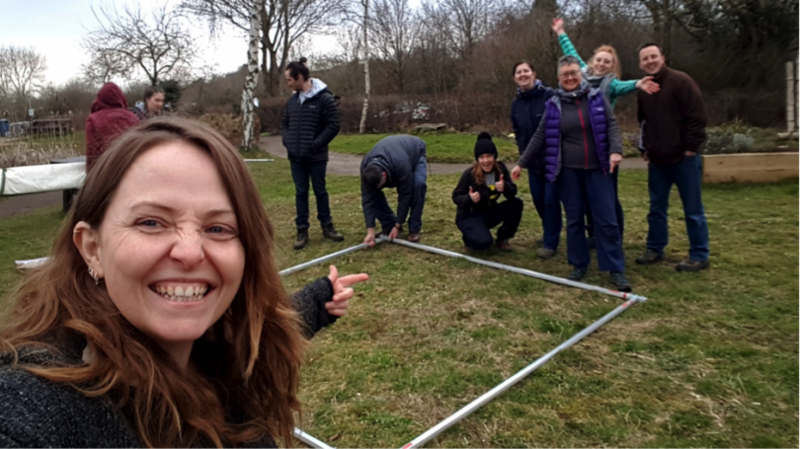 I recently wrote an article about a bat survey project that I run here in the West Midlands studying bats in the urban fringe. I’m going to be covering year 2 of that project in detail for Inside Ecology over the next 6 months. 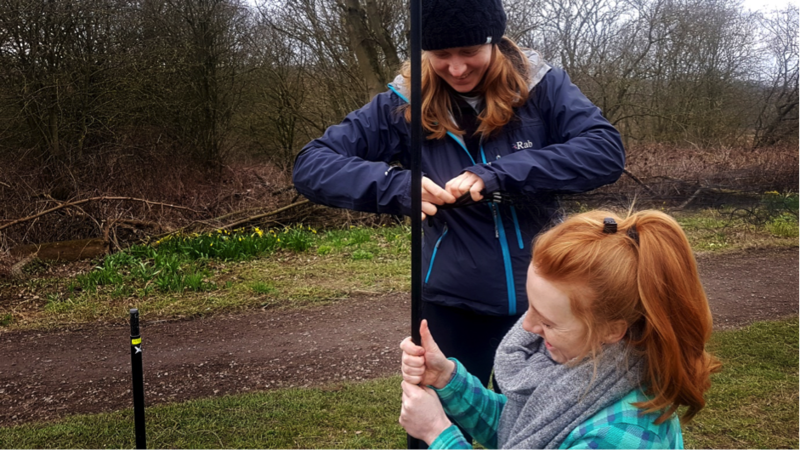 I hope to give you a taste of what it’s like running a large-scale, conservation-based bat survey: the ups and downs, the adventures, the discoveries and the things we learn about urban bats. So I thought I’d start with a glimpse into the preparation stage! 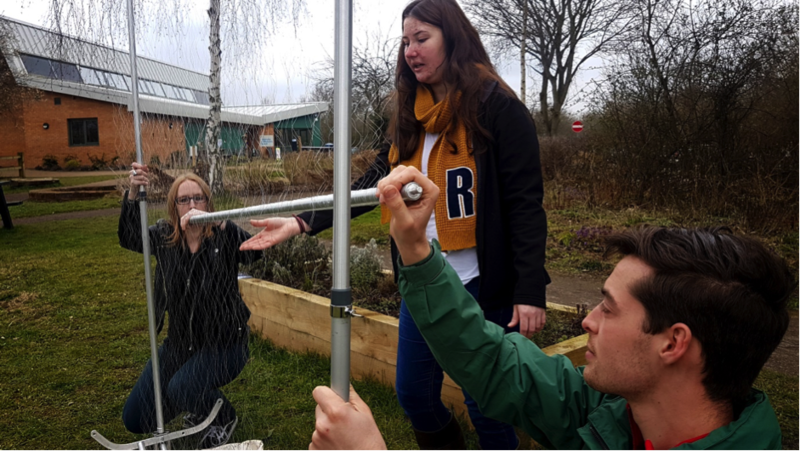 We’re about to hit the year 2 survey season, and I was determined that this year, we would hit the ground running – that my volunteers would feel prepared and as confident as possible going in to the spring season. Last year, the setting up of equipment was done by a few people who knew how, but because this year the survey is much bigger, (more kit, more sites, more data) there was no way I could get away with just 2 or 3 of us setting up the site twice a week. 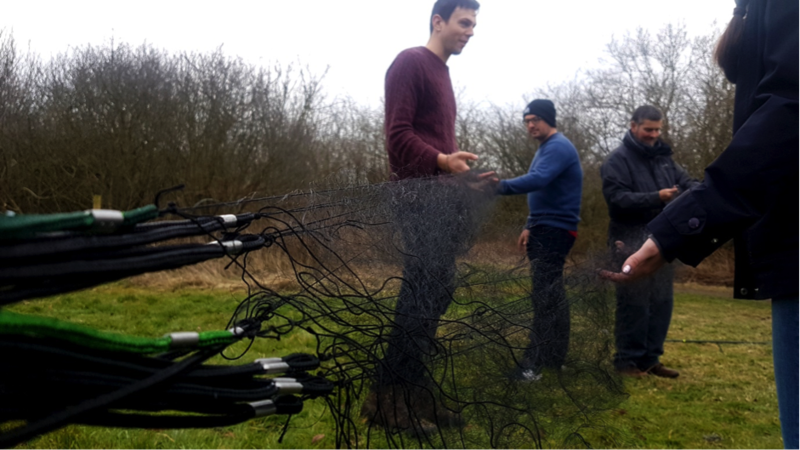 So, this weekend, my project leaders and I taught 16 volunteers how to put up harp traps and mist nets. And take them down. And put them up again. And take them down again… you get the idea. Of course, the best way to make people learn things is to divide and conquer: split them up into teams and make things competitive! With a fair amount of chocolate-based ‘prizes’, we worked for hours teaching each other, helping each other and learning the principles of setting traps and nets. Over and over again. So, did it work? Are they feeling prepared? To find out, I had them each take part in an anonymous online poll, asking them to gauge their level of confidence with harp traps and mist nets both before and after the course. For harp traps, before the training, only 1 person judged themselves to be either ‘confident’ or ‘very confident’ in setting them up and taking them down; after the course 11 of them said they were ‘confident’ or ‘very confident’. For mist nets (a bit trickier! ), before the course, one person said they were ‘confident’ or ‘very confident’, rising to 6 after the course. I’ll take that. It was two days of preparation, taking instructional photos and making handouts, and a full day on site teaching (including loading kit into the car and lugging it around). But those kinds of results are reward in themselves. Every bit of time, toil and preparation was worth it. I was exhausted by the end of the day. Truth be told, I was flat out asleep on the sofa by 7pm. But I had a moment, as we were doing an end-of-course debrief, when I was overwhelmed with what the Danes call ‘hygge’… These people (lunatics, all!) are as excited as I am about this project. And more than anything, they’re genuinely a TEAM. They communicate with each other, support each other, teach each other, make each other cups of tea, and spend literally HOURS and HOURS sitting in the cold, dark woods together to try to learn about and conserve bats. They’re probably insane, but they are my tribe.